Ibovespa Tumbles Toward Bear Market as Rousseff’s Win Sinks Real. Brazil’s benchmark equity index led global declines as President Dilma Rousseff’s re-election damped speculation for a change in policies that wiped out $553 billion of stock market value and left the economy in recession. The Ibovespa (IBOV) dropped 2.8 percent to 50,503.66 at the close of trading, the most among the 20 biggest indexes globally. After tumbling as much as 6.2 percent earlier, approaching the threshold for a bear market, the gauge pared losses as education companies and pulp exporters rallied. The real posted the world’s biggest loss as it sank 1.9 percent to a nine-year low. State oil company Petroleo Brasileiro SA (PETR4) tumbled 12 percent. The Ibovespa is now down 18 percent from a bull-market high reached Sept. 2. The equity gauge had rallied as much as 38 percent from this year’s low in March amid bets that Senator Aecio Neves would unseat an incumbent who oversaw the slowest growth of any Brazilian presidency in two decades as inflation accelerated past the top end of policy makers’ target. Rousseff, who has maintained record low unemployment, had 52 percent of the vote with 99.99 percent of ballots counted by the electoral court. The Ibovespa last entered a bear market in March as Rousseff’s attempts to shore up growth through subsidized credit from state-run banks and tax cuts on consumer goods failed to avoid a slowdown, then moved back into a bull market in May after polls showed the incumbent losing voter support. After rising to a 20-month high in September, stocks retreated after new surveys showed Rousseff rebounding. “There’s going to be enormous disappointment in the markets that we have not had an opposition victory,” Geoffrey Dennis, the head of emerging-market strategy at UBS AG, said in a telephone interview. The real’s plunge to 2.5224 per dollar put it at the weakest level on a closing basis since April 2005. One-month implied volatility on options for the real, reflecting projected shifts in the currency, was the world’s highest. The currency sank 12 percent in the past three months. Petrobras and state-controlled utility Centrais Eletricas Brasileiras SA were the two worst performing stocks in the 834-member MSCI Emerging Markets Index today as the utility’s voting shares sank 12 percent. “The natural reaction by investors, at this moment, is to sell, with considerable nervousness prevailing,” Camila Abdelmalack, an economist at CM Capital Markets in Sao Paulo, said in a telephone interview. The Ibovespa pared losses as for-profit college operators Estacio Participacoes SA and Kroton Educacional SA both rallied more than 7 percent on speculation that Rousseff’s student-loan program will continue to boost enrollments. Exporters including pulp producer Fibria Celulose SA also jumped as the real weakened, boosting the outlook for sales outside Brazil. Fibria climbed 6 percent to 28.95 reais, the highest since November. Financial shares also dropped today, with state-run Banco do Brasil SA plunging 5.2 percent to 24.40 reais, the lowest closing level since June. Itau Unibanco Holding SA lost 3.5 percent to 32 reais, while Banco Bradesco SA fell 2.2 percent to 32.92 reais. The iShares MSCI Brazil Capped ETF dropped 5.5 percent to $39.30 at 3:34 p.m. in New York, while the Lyxor ETF Brazil Ibovespa ETF (RIO) declined 7.8 percent in Paris, the biggest slide since 2009, with volume more than five times the three-month daily average. The NEXT Funds Ibovespa Linked ETF (1325) declined 6.8 percent at the close in Tokyo, the biggest loss since September 2011, on volume exceeding 12 times the average. Throughout the campaign, Brazil’s stock market and currency retreated when polls indicated Rousseff might win, including a 6.8 percent drop in the Ibovespa during the final week as polls showed her support rising. Neves, who had pledged to cut public spending and attract more private investment, said in his concession speech that he phoned Rousseff to congratulate her on the victory, calling on the president to unify the country. Rousseff defended her economic performance by saying she preserved jobs in the face of the global economic crisis. While the economy entered recession in the first half of this year, September’s 4.9 percent unemployment rate was a record low for the month. 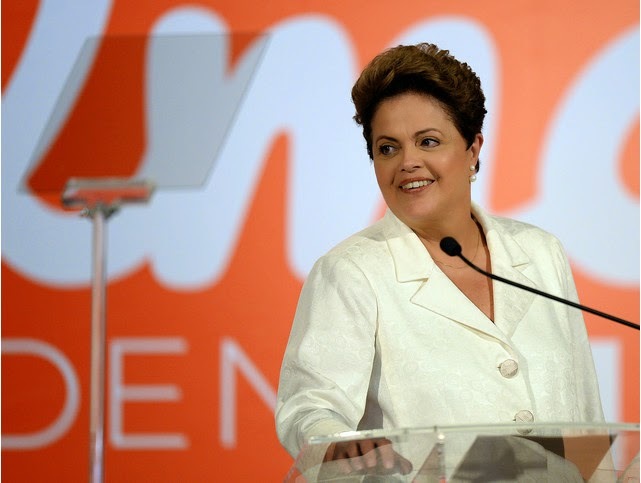 Real average income has risen 10 percent during Rousseff’s tenure and 33 percent in the past decade. Credit-default swaps insuring Brazil’s debt against non-payment rose two basis points today to 167 basis points, according to prices in New York compiled by Bloomberg. The contracts have risen from the year’s low of 124 basis points on Sept. 3. Brazil’s benchmark dollar bonds due 2025 fell 0.37 cent to 100.95 cents on the dollar while yields on local fixed-rated notes due 2023 rose 0.33 percentage point to 12.37 percent. Investors will turn their focus to Rousseff’s choice for finance minister, said Frederico Sampaio, the chief investment officer of Franklin Templeton Investments Brazil, which manages about $900 million. Rousseff has said that her new government will have a fresh team, including a replacement for Finance Minister Guido Mantega. The president’s fiscal policies fueled Brazil’s first sovereign rating cut in more than a decade, while the government’s attempts to control inflation by intervening in state-run companies sapped profits. Quantitas, an investment boutique that manages 15 billion reais, estimated last week there is a 50 percent chance Brazil’s rating could be cut to junk in Rousseff’s second term. Brazil’s dollar bonds returned 8.7 percent this year, trailing the average 10.1 percent advance for investment-grade developing nations, JPMorgan Chase & Co. indexes show. In Rousseff’s first three years in office, the notes posted an annual gain of 5.04 percent, lagging behind the 5.6 percent return for similarly rated sovereign peers. To support the currency, Brazil’s central bank sold $197.2 million of foreign-exchange swaps today as part of an intervention program and rolled over contracts worth $393.4 million. The Ibovespa ended last week with a valuation near a five-month low of about 10 times estimated earnings. Stocks won’t be attractive until valuations fall to about 8 times, according to UBS and USAA Investment Management Co.